You are not the only one that loves a good massage. So does your kale. Massaging your kale with a splash of olive oil, some lemon and a pinch of salt breaks down the kale and turns it into a relaxed and easily digestible crucifer. This recipe takes kale massaging one step further and finishes the massage by rubbing half an avocado into the leaves. No additional dressing needed. This is my favorite massaged kale salad. It is delicious and can be assembled in about 15 minutes. The avocado massage is a luscious starting point for lots of different variations. Once you make this recipe, let your imagination be your limit and experiment with adding a variety of nuts, seeds, fruits, vegetables, grains and cheeses. If I have a ripe mango on hand, I will substitute chopped mango for orange segments. An avocado spa treatment for your kale mellows this cantankerous crucifer, and eliminates the need for a separate dressing. You will be hooked on this super easy and delicious way to prepare one of earth's healthiest foods. Cut the spines from the kale. Chop the kale leaves into 2 " squares. Put in a large non-aluminum bowl. 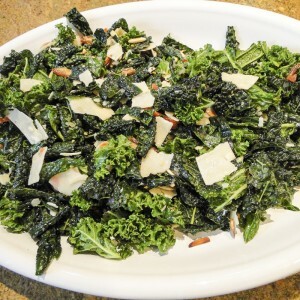 Splash a couple tablespoons of olive oil (no need to measure) and sprinkle a generous pinch of sea salt on the kale. Using your hands, massage the kale until the texture and color changes to supple and darker green. Total massage time will vary between 1 and 5 minutes depending on the type of kale you are using and the maturity of the kale. When color and texture begin to change add juice from 1/2 lemon. Massage in with your hands for a another minute or so. When you think kale is just about ready, scoop out half of the avocado and massage that in to the kale, coating all the leaves. Cut the skin from the orange and segment the orange. Add diced avocado, orange segments, onion slices and toasted pumpkin seeds to the massaged kale. Toss. Adjust lemon juice to taste. Amazing how “massaging” kale makes it less tough and more able to absorb the lemon and avocado. The great thing is now that you have the massaging technique down, you can come up with all kinds of great variations. 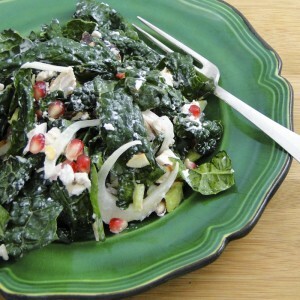 too much kale…substituted papaya & pomegranate seeds which was nice color against the dark green. Yes, the kale does almost “cook down” when you massage it. So start with about 50% more than you think you will need. I love the papaya and pomegranate seed combo. Very festive, and I bet tasty! I always love Kale in restaurants but didn’t know how to “soften” it up for home. This was perfect! Even my husband, who doesn’t like new things thought this was a great salad.